Tobacco use causes over 440,000 premature deaths every year in the United States, or about 20 percent of all annual mortality in the nation. Such statistics remind us of the enormity of the problem, yet offer no insight into how tobacco-related disease is experienced by individuals and their families. Smoke Damage fills this gap by putting a human face on America's most profitable and most preventable epidemic. 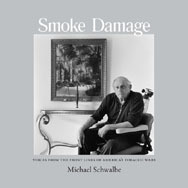 Through interviews and photographs, sociologist Michael Schwalbe takes readers beyond the usual statistics and shows the real people—disease survivors, "tobacco widows," educators, activists, legislators, lawyers, researchers, and farmers—on the front lines of America's ongoing tobacco wars. The result is a poignant study of how tobacco-related disease is experienced not only by its victims but also by those who are dedicated to fighting it. In his introductory essay, Schwalbe examines the scope of the tobacco problem, discusses its economic roots, and writes of his own experience of tobacco's costs. In his afterword, he explores patterns in the lives of disease survivors, offers policy recommendations, and invites readers to take action. Smoke Damage is for anyone whose life has been touched by tobacco-related disease and who wants to understand why the epidemic persists and what can be done to end it. Michael Schwalbe is professor of sociology at North Carolina State University. He is author of Unlocking the Iron Cage: The Men's Movement, Gender Politics, and American Culture, The Sociologically Examined Life, and Rigging the Game: How Inequality Is Reproduced in Everyday Life.